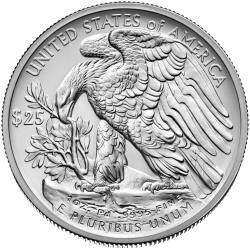 Palladium Coins are an excellent option for discerning collectors or investors as the popularity of the silvery-white Precious Metal continues to grow. We stock a wide selection of premium-grade Palladium Coins from respected manufacturers like the Royal Canadian Mint and Australia’s Perth Mint and you’ll find today’s best prices online at coininvest.com. Although rarer, Palladium Coins are cheaper to buy than similar Gold Coins so more buyers are choosing palladium with an eye on the future. Palladium is a member of the Platinum family of Precious Metals and, like platinum, this scarce metal is sought after for use in technology and industry. Most of the palladium used by mints and refiners comes from South Africa or Russia where government restrictions on exportation, power outages, or labour issues can all disrupt supply. Prices can fluctuate, making now the ideal time to invest in Palladium Coins. Palladium Coins are minted with a millesimal fineness of .9995 and are available in a range of sizes. The Canadian Maple Leaf is one of the best-loved Bullion Coins and it has been a hit with collectors and investors since the first Gold Maple Leaf was introduced as a rival to the South African Krugerrand in 1979. The Palladium Maple Leaf Coin made its debut in 2005 and it was the first palladium product to be manufactured by the Royal Canadian Mint. This exceptional Palladium Coin was created for the Cook Islands by the Perth Mint in Australia. Often referred to as the ‘Bounty’, the Cook Island Palladium Coin quickly captivated collectors with its .9995 purity and its unique design featuring the historic sailing ship, HMS Bounty. Discover our complete range of Palladium Coins or explore alternatives like Palladium Bars. This rare Precious Metal is known to retain or increase its value over time making Palladium Coins suitable for both collectors and investors. All Palladium Coin orders are securely packaged and insured for safe shipping and delivery when you shop online with coininvest.com.